José Abad Santos (1886–1942), Chief Justice of the Supreme Court of the Philippines. John Abbott (1821–1893), Canadian Prime Minister. Initiated St. Paul's, No. 374, E.R., Montreal, 1847. William "Bud" Abbott (1895–1974), American comedian and actor (part of the Abbott & Costello comedy team). Roy Acuff (1903 – 1992), American country music singer. Sherman Adams (1899–1986), American politician (Elected to U.S. Congress and as Governor of New Hampshire). Gregorio Aglipay (1860–1940), Supreme Bishop of the Philippine Independent Church. Nelson W. Aldrich (1841–1915), United States Senator from Rhode Island. Treasurer of the Grand Lodge of Rhode Island 1877–78, member of What Cheer lodge. Edwin "Buzz" Aldrin (1930–), American Astronaut. Montclair Lodge No. 144, New Jersey. Elizabeth Aldworth (1693/95-1773/1775), Noted female Mason. Entered Apprentice and Fellowcraft Degree in 1712. Vasile Alecsandri (1821–1890), Romanian Poet, playwright, politician and diplomat. Alexander I of Yugoslavia (1888–1934), Last king of the Kingdom of Serbs, Croats and Slovenes (1921–29) and first king of the Kingdom of Yugoslavia (1929–34). Salvador Allende (1908–1973), President of Chile (1970–1973). Lodge Progreso No. 4, Valparaíso. Edward Andrade (1887–1971), English physicist. Initiated into Lodge Progresso No. 4 in 1935. Galicano Apacible (1864–1949), Filipino politician. Sir Edward Victor Appleton (1892–1965), British physicist. Nobel Prize 1947. Isaac Newton Lodge No. 859, Cambridge. John Armstrong, Jr., 1758–1843), American soldier, delegate to the Continental Congress, United States Senator and United States Secretary of War. Hibernia Lodge No. 339, New York. Henry H. Arnold (1886–1950), American general, only person to hold five-star rank in two branches of service. Union Lodge No. 7, KS. Stephen F. Austin (1793–1836), Secretary of State for the Republic of Texas. Louisiana Lodge No. 109, Missouri. Allen Bristol Aylesworth (1854–1952), Canadian politician. Simmons Jones Baker (1775–1853), US physician, planter, and legislator. Grand Master of Masons of North Carolina in 1832 and again in 1840. Laid the cornerstone of the state capitol building in Raleigh, North Carolina on July 4, 1833. Birch Bayh (1928–), US Senator from Indiana from 1962–1981. Gunning Bedford, Jr. (1747–1812), Signer of the US Constitution, first Grand Master of Masons in Delaware. John Blair, Jr. (1732–1800), Associate Justice of the Supreme Court of the United States (1789–96), and Grand Master of Virginia from 1778 to 1784. Walter Breuning, World's oldest man at the time of his death of natural causes on April 14, 2011, aged 114 years, six months, twenty-five days. Member of Great Falls Lodge No. 118, Great Falls Montana for over 85 years. William A. Brodie, Laid the foundation stone of the Statue of Liberty on August 5, 1884 as Grand Master of New York. Henry P. H. Bromwell (1823–1903), U.S. Congressman (1865–1869), Grand Master of the Grand Lodge of Illinois in 1865. Author of Restorations of Masonic Geometry and Symbolry. Daniel Butterfield, General of the Federal Army during the U.S. Civil War, Medal of Honor recipient and composer of the bugal song taps. Metropolitan Lodge No. 273, New York City. Manuel Camus, Philippine Senator. October 12, 1898, Zetland in the East Lodge No 508 Singapore, under the jurisdiction of the M. W. Grand Lodge of England. George Canning, British politician and Prime Minister. Lord Randolph Churchill, Winston Churchill's father, initiated 9 Jan 1871 in Churchill Lodge. William Crosby Dawson, U.S. Judge and Politician, San Marino Lodge No. 34, F.&A.M, Greensboro, Georgia. Grand Master of Masons in Georgia from 1843 until his death in Greensboro on May 6, 1856. John David Eaton, President of the Canadian based T. Eaton Company. Assiniboine, No. 114, G.R.M., Winnipeg. Prince Edward, Duke of Kent, (Prince Edward George Nicholas Paul Patrick), member of the British Royal Family, Grand Master of the United Grand Lodge of England, member of various lodges including Grand Master's Lodge No 1 and Royal Alpha Lodge No 16 (both English Constitution). Ben Espy, American politician, served in the Ohio Senate. Eberhard Faber, Founder of the Faber Pencil Company. Chancellor Walworth No. 271, New York. Ettore Ferrari, Italian sculptor. Grand Master of the Grande Oriente d'Italia. Jules Ferry, French politician. Member of the Alsace-Lorraine Lodge of Paris. Ignaz Aurelius Fessler, Hungarian ecclesiastic and writer. 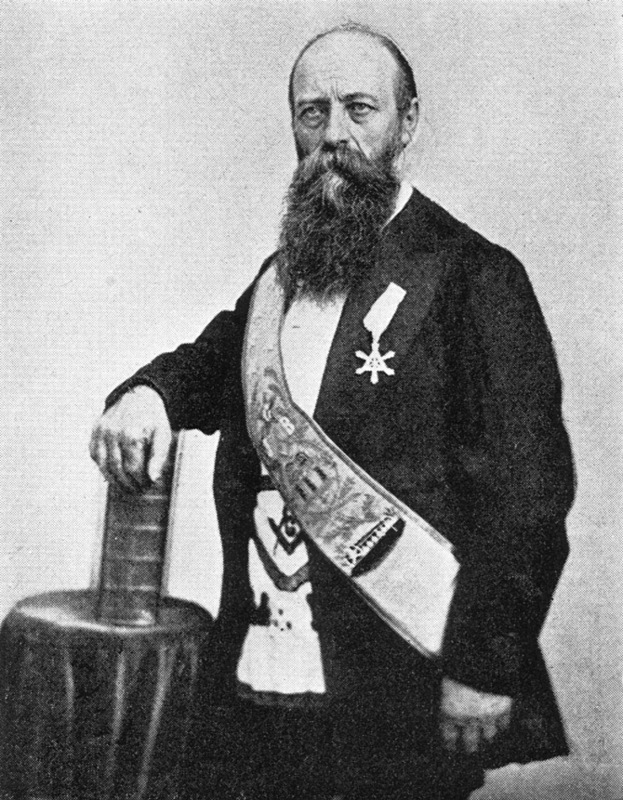 Member of Lodge Pythagoras of the Blazing Star in Berlin. Johann Gottlieb Fichte, German philosopher. Member of Lodge Pythagoras of the Blazing Star in Berlin. Charles Grandison Finney, American preacher, evangelist and author (1792–1875). Meridian Sun Lodge No. 32 in Warren, New York. Finney asked for dismissal and was discharged. Geoffrey Fisher, The 99th Archbishop of Canterbury and head of the worldwide Anglican Communion. Alexander Fleming, Scottish biologist and pharmacologist. London Scottish Rifles Lodge No. 2310. Sandford Fleming, Canadian engineer and inventor. St. Andrew's No. 16, Toronto, Ontario. Dr. Walter Fleming, Co-founder of the Shriners. William J. Florence, Co-founder of the Shriners. Frederick the Great, King of Prussia. Member and founder of the lodge Zu den drei Weltkugeln (Of the Three Globes). Federico García Lorca, Spanish poet and playwright. Alhambra Lodge, as 'Homero'. Giuseppe Garibaldi, Italian general; fused the Rites of Memphis and Misraim in 1881. Licio Gelli, Italian politician. Worshipful master of Propaganda Due – Expelled in 1981 (some say 1976) by the Grand Orient of Italy. Ion Ghica, Twice Prime Minister of Romania, four-time President of the Romanian Academy. W. S. Gilbert, One half of 'Gilbert and Sullivan'. James Glasgow, Who was the first North Carolina Secretary of State from 1777 to 1798. He was an early officer of the Grand Lodge of North Carolina but was ultimately expelled from Freemasonry due to the scandal known as the Glasgow Land Fraud. Johann Wolfgang von Goethe, German philosopher and Poet. Lodge Amelie, Weimar. Octavian Goga, Prime Minister of Romania (1937–38). Alexandru G. Golescu, Prime Minister of Romania (1870). Sir John Gorton (1911–2002), 19th Prime Minister of Australia. Initiated into Freemasonry at Kerrange Lodge No 100 UGLV on 5 Feb 1948. Chuck Grassley, Member of the United States Senate from Iowa. Henri Grégoire, Roman Catholic priest, Constitutional bishop of Blois and French revolutionary leader. Jules Grévy, President of the French Third Republic (1879–1887). Virgil I. Grissom, American astronaut. Mitchell Lodge No. 228, Mitchell, Indiana. Milan Grol (1876–1952), Serbian literary critic, politician and the last president of the Yugoslav Democratic Party, which was banned by the communist regime of Josip Broz Tito in 1946. Douglas Haig, 1st Earl Haig, British Field Marshal, Commander British Expeditionary Forces. Elgin Lodge No. 91, Leven, Scotland. Prince Hall, Founder of Prince Hall Freemasonry. Lionel Hampton, American jazz musician, member of Prince Hall in New York. John Hancock, American revolutionary, merchant and statesman. John M. Harlan, US Associate Supreme Court Justice. Colonel John Harrelson, First Chancellor of NCSU, Raised 28 August 1909 into William G. Hill Lodge No. 218, Raleigh, North Carolina. Member of NCSU Chapter of Square and Compass. Claude Adrien Helvétius, French enlightenment philosopher. Percy Herbert, Bishop of Norwich, and Provincial Grand Master for Norfolk. Joseph Hewes, Signer of the American Declaration of Independence. Christopher L. Hodapp, Author, Broad Ripple Lodge no. 643 F&A.M., Indianapolis, Indiana. J. Edgar Hoover, First Director of the FBI. Grand Cross. Federal Lodge No. 1, Washington, D.C.
Frank Reed Horton, 1918; Royal Arch/York Rite, 1919; Scottish Rite. Founder of Alpha Phi Omega. Tim Horton, Canadian ice hockey player. Initiated in Kroy Lodge No. 676, Toronto, Ontario, in 1962. Sam Houston, Governor of Tennessee, President of the Republic of Texas, first Governor of the State of Texas, US Senator. Initiated at Cumberland Lodge No. 8, Nashville, Tenn.
William Howley, The 90th Archbishop of Canterbury, and head of the worldwide Anglican Communion. Royal York Lodge, Bristol, England. Richard Morris Hunt, American architect, designed the base of the Statue of Liberty. Camille Huysmans, Mayor of Antwerp and Prime Minister of Belgium. Charles Ingalls, (January 10, 1836 - June 8, 1902) was the father of Laura Ingalls Wilder, known for her Little House on the Prairie series of books. Ingalls is depicted as the character "Pa" portrayed by Michael Landon in the television series. Nat Jackley, English comic actor. Graciano López Jaena, Filipino writer and journalist in the Philippine Revolution. Worshipful Master at Logia Povernir No. 2. Major-General (retired)Michael Jeffery, AC, CVO, MC Governor-General of Australia (2003–2008) and Former CO of SAS Regiment, Initiated in St George's Lodge No 6 on 23 November 1994. Nathaniel R. Jones (1926–), American lawyer, jurist, and academic, Judge on U.S. Court of Appeals for the Sixth Circuit. Slobodan Jovanović (1869–1958), Serbian jurists, historians, sociologists and president of the Yugoslav government in exile, in London, during World War II. Henry Knox, Major General and Commander of the Continental Artillery during the American War for Independence. He is thought to have been a member of St. John's Regimental Lodge at Morristown. He has been credited with helping to constitute Washington Lodge at West Point. He is listed as a visitor to a number of other lodges. Frank S. Land, Member of the Ivanhoe Lodge #446 on June 29, 1912 in Kansas City. He was the founder of the Order of DeMolay. Franz Liszt, Composer. Lodge zur Einigkeit, Frankurt. John A. Macdonald, First Prime Minister of the Dominion of Canada (1867–1873 and 1878–1891). Began the creation of rail service across Canada. St. John's Lodge No. 758, Kingston, Ontario. Honourary Past Grand Senior Warden. John Bayne Maclean, Canadian founder of Maclean's Magazine and President of Maclean's Publishing Co. Ionic Lodge No. 25, Toronto, ON. Giuseppe Mazzini, Italian Revolutionary, Grand Master of the Grande Oriente d'Italia Some sources question his membership. John Molson, Founder of Molson Breweries. St. Paul's Lodge, No. 374 UGLE, Montreal. Past Provincial Grand Master. Wolfgang Amadeus Mozart, Composer. Zur Wohltätigkeit (Charity) Lodge, Austria. Composed several pieces of Masonic ritual music, the first at age 11. Charles Samuel Myers, English pioneer psychologist of the Royal Society, coined the term "shell shock". Member and founder of multiple lodges. Initiated 1895 at Isaac newton Lodge # 859. Dositej Obradović (1742–1811), Serbian author, philosopher, linguist, polyglot and the first minister of education of Serbia. Hans Christian Oersted (1777–1851), Danish physicist and chemist who discovered that electric currents create magnetic fields. Shaquille O'Neal, American professional basketball player, and entertainer. Made a Mason at Sight in Widow's Son Lodge No. 28 PHA, Boston, Massachusetts. Camilo Osías, President of the Senate of the Philippines. Derwyn Owen, Archbishop of Toronto, and Primate of the Anglican Church of Canada, Ionic Lodge No 25, Toronto. Brad Paisley, American country music artist, Southern Jurisdiction, Scottish Rite. Alexandru Paleologu, Romanian essayist, literary critic, diplomat and politician. Rafael Palma, Filipino politician, writer, and educator. Fourth President of the University of the Philippines. Bagong Buhay Lodge No. 291 (renumbered No. 16) July 14, 1908. Affiliated with Sinukuan Lodge No. 16 and in 1920 became Grand Master, the unified Grand Lodge of the Philippine Islands. Charles Willson Peale, Esteemed American artist and portrait painter. Pedro I of Brazil, Emperor of Brazil. John Penn, Proprietary governor of Pennsylvania, member of first lodge of Philadelphia. James Cash Penney, Founder of J. C. Penney department stores. Wasatch Lodge No. 1 in Salt Lake City, Utah. John J. Pershing, Commander, American Expeditionary Force, World War I, Lincoln Lodge No.19, Lincoln, Nebraska. Prince Philip, Duke of Edinburgh, Husband of Queen Elizabeth II, Navy Lodge No 2612, London. Albert Pike, Confederate general, re-wrote rituals for Scottish Rite (Southern Jurisdiction), author of Morals and Dogma, Western Star Lodge No. 2, Little Rock, Arkansas. Sovereign Grand Commander AASR, Southern Jurisdiction. Augustus Le Plongeon, French Archaeologist. First to survey and excavate at Chitchen Itza. Michael Pocalyko, American business executive and novelist. Alexandria-Washington Lodge No.22, Alexandria, Virginia. Joel Roberts Poinsett, U.S. statesman, diplomat, physician and botanist. Mariano Ponce, Filipino physician Initiated in Madrid and became Secretary of Logia Revoluccion and Logia Solidaridad 53. He also became a 33° A&AR mason under the auspices of the Gran Oriente Español. William Preston, Author of Illustrations of Masonry. Giacomo Puccini, (1858–1924) Italian Composer. Mihajlo Idvorski Pupin (1858–1935), A.k.a. Michael I. Pupin Serbian and American physicist and physical chemist. Rufus Putnam, Surveyor, General in the U.S. Revolutionary War. Elected first Grand Master of Masons in Ohio. Manuel L. Quezon, First president of the Commonwealth of the Philippines under U.S. occupation rule in the early period of the 20th century. Raised March 17, 1908 at Sinukuan Lodge No. 272 (renamed Sinukuan Lodge No. 16). First Filipino Grand Master of the Grand Lodge of the Philippine Islands that was established in 1917. Ion Heliade Rădulescu, Romanian academic, poet, essayist, memoirist, short story writer, newspaper editor and politician. Andrew Michael Ramsay (1686–1743), Commonly known as Chevalier Ramsay. Jacobite peer, author of Discourse pronounced at the reception of Freemasons, which first proposed the idea that Freemasonry descends from crusading knights. Sam Rayburn, U.S. politician, U.S. Speaker of the House; took his first degree Aug. 7 1922, remained Entered Apprentice upon his death, Constantine Lodge No.13. Theodor Reuss, German occultist and head of O.T.O., Pilger Loge #238 (UGLE) 1878, and excluded from Freemasonry in 1880. Paul Revere, American Revolutionary hero, St. Andrew's Lodge, Boston, Massachusetts; Grand Master of Massachusetts 1794–97. Isabelo de los Reyes, Filipino politician and labor activist in. Donn Reynolds, Canadian country music singer & world champion yodeler; Initiated April 1990: Flower City Lodge No. 689, Brampton, Ontario, Canada. Eddie Rickenbacker, WWI American Flying Ace, Kilwinning Lodge No. 297, MI. Charles Riley, Anglican Archbishop, Grand Master of District Grand Lodge of Western Australia 1904–17, 1920–29. Constantin Daniel Rosenthal, Romanian painter and 1848 revolutionary. C. A. Rosetti, Romanian literary and political leader, participant in the Wallachian Revolution of 1848. Manuel Roxas, Was the first president of the independent Republic of the Philippines. Alecu Russo, Romanian writer, literary critic and publicist. George Sterling Ansel Ryerson, Canadian politician. Mihail Sadoveanu, Romanian Novelist, short story writer, journalist and political figure, Grand Master from 1932. Leverett Saltonstall, Governor of Massachusetts, United States Senator from Massachusetts. Member, Fraternity Lodge, Newton, Massachusetts. Lope K. Santos, Tagalog language writer from the Philippines. first Worshipful Master of Magat Lodge No. 68 in Bayombong, Nueva Vizcaya. Emanuel Schikaneder, German impresario, dramatist, actor, singer and composer. He is remembered today as Mozart's librettist for The Magic Flute, an opera with Masonic themes. Heath Shuler, United States Congressman for North Carolina, Oconee Lodge 427. Jean Sibelius, Composer, Suomi Lodge No. 1, Helsinki, Finland, 1922. Wrote several pieces of interest to Masons including "Praising Hymn" and the "Ode to Fraternity." Angelo Soliman, Slave brought to Europe who became the first black African-born Freemason. True Harmony Lodge in 1783. John Philip Sousa, Composer, Hiram Lodge No. 10, Washington, D.C.
George Spencer-Churchill, 8th Duke of Marlborough, Initiated 9 Jan 1871, with brother Randolph. Bernard Spilsbury, British forensic scientist. Louis Spohr (1784–1859), German composer. Stevan Sremac (1855–1906), Serbian realist and comedy writer. Thomas Patten Stafford, Gemini and Apollo astronaut. Western Star Lodge No. 138, OK.
Jock Stein, football manager of teams including Celtic F.C. and Scotland. Charles Mortram Sternberg, Canadian paleontologist,Civil Service Lodge No. 148 Ottawa, Ont. Louis Stokes (1925–), American politician, served in the United States House of Representatives. William Leete Stone, Sr., Journalist and historian. Author of works regarding Freemasonry and its opponents. Philipp von Stosch, Occultist, antiquarian and English spy. Gustav Stresemann, Chancellor (1923) and foreign minister (1923–1929) of the Weimar Republic. William Stukeley, English archaeologist and antiquarian. Lodge at Salutation Tavern, London. Alexandru Sturdza, Russian publicist and diplomat of Romanian origin. Dimitrie Sturdza, Four-time Prime Minister of Romania, president of the Romanian Academy (1882–1884). Arthur Sullivan, Sullivan of 'Gilbert and Sullivan', and was also Grand Organist of the UGLE in 1887. John Swett, Founder of the California public school system, Phoenix Lodge No. 144, San Francisco, California. Dave Thomas, Founder of Wendy's, raised as a Master Mason in Sol. D. Bayless Lodge No. 359 Fort Wayne, Indiana. Although he joined Scottish Rite in the Northern Masonic Jurisdiction, he received the 33rd degree in 1995 from the Southern Jurisdiction. Traian Vuia, Romainan inventor and early aviation pioneer. Elijah Wadsworth, Major General of Ohio Militia War of 1812. Master of the Erie Lodge (later Western Star Lodge No. 21) in Ohio, 1813. General Jonathan Wainwright, WWII General; Union Lodge No.7, Junction City, Kan. 1946. Sir Charles Warren, English archaeologist. Surveyor of Herod's Temple. Royal Lodge of Friendship No. 278, Gibraltar. Joseph Warren, American physician and major general during the American Revolutionary War, joined the Lodge of Saint Andrew in Boston, later serving as Grand Master of Masons in Massachusetts. George Washington, General, Politician, and First President of the United States. Initiated in Fredericksburg VA, Past Master of Alexandria Lodge No. 22, Virginia. James Watt, Scottish inventor and engineer, Royal Society. Initiated in a Scottish Lodge in 1763. Thomas Smith Webb, New England Lodge No. 4, Worthington, Ohio, author of Freemason's Monitor or Illustrations of Masonry, sometimes called the "Founding Father of the York or American Rite" for his efforts to promote that masonic body. Ralph Wilson, American businessman and founder of the Buffalo Bills of the NFL, member of Kilwinning Lodge No. 297 in Detroit. Frederick Thomas Wimble, Australian politician and founding editor of the Cairns Post. Coleman Young (1918–1997), American politician, mayor of Detroit, Michigan from 1974 to 1993. Duiliu Zamfirescu, Romanian novelist, poet, short story writer, lawyer, nationalist politician, journalist, diplomat and memoirist. ^ "Filipino Famous Mason – Jose Abad Santos". Most Worshipful Grand Lodge of the Philippines. Retrieved 2010-01-12. ^ "Famous Prince Hall freemasons". Grand Lodge of British Columbia and Yukon A.F. & A.M.. Retrieved 25 April 2012. ^ "Famous Masons". Retrieved 25 April 2012. ^ a b c d e f g h i j "Masonic Actors, Musicians and Screen Writers". Phoenixmasonry.org. Retrieved 25 April 2012. ^ "Famous Filipino Mason – Nicanor Abelardo". Most Worshipful Grand Lodge of the Philippines. 1934-03-21. Retrieved 2010-01-12. ^ Research, Masonic. "Famous Freemasons". Pinal Lodge No. 30. Retrieved 28 July 2012. ^ a b c Denslow. 10,000 Famous Freemasons. Cornerstone Book Publishers. ^ "Famous Filipino Mason – Bishop G. Aglipay". Most Worshipful Grand Lodge of the Philippines. Retrieved 2010-01-12. ^ a b c d "Famous Freemasons Masonic Presidents". Calodges.org. Archived from the original on August 2, 2008. Retrieved 2010-01-12. ^ "Mrs. Elizabeth Aldworth". Biography/Aldworth. Grand Lodge of British Columbia and Yukon A.F. & A.M.. 2002-02-25. Retrieved 2007-04-25. "upon secretly observing the first two degrees of a lodge at labour in her father's home, she was discovered and, after discussion, initiated in the Entered Apprentice and Fellowcraft Degree. A champion of Freemasonry"
^ a b c d e f g h i j k l m n o p q r s t u v w x y z aa ab ac ad ae af ag ah Stoica, Stan (coordinator). Dicţionar de Istorie a României, p. 153-5. Bucharest: Editura Merona, 2007. ^ "Africa's Freemasons: A strange inheritance". Le Monde diplomatique (English Edition). September 1997. Retrieved 2010-01-12. ^ a b c d e f g h i "Pro Grand Master". Encyclopedia of Freemasonry: A Complete Masonic Information Resource. 2012. Retrieved 4 August 2012. ^ Leslie Stephen, ed. (1885). "Anderson, James (1680?-1739)". Dictionary of National Biography 1. London: Smith, Elder & Co.
^ Our Ministers – Rabbi Dr Raymond Apple AO RFD, Great Synagogue (Sydney). Retrieved 5 April 2010. ^ "Atlas Pythagoras Lodge website". Atlaspythagoras.com. Retrieved 2010-01-12. ^ Denslow, William R.; Truman, Harry S. (2004). 10,000 Famous Freemasons from A to J. Kessenger Publishing LLC. ISBN 1-4179-7579-2. Retrieved 2010-08-06. ^ "Masoniclibrary.com" (PDF). Retrieved 2010-01-12. ^ a b c d e f g h i j k l m "Wisdom Lodge List of Famous Freemasons". Wisdom Lodge #202 Pasadena, CA. Retrieved 2012-01-23. ^ a b Rose, Gerry (November 29, 1993). "The Venetian Takeover of England and Its Creation of Freemasonry". The American Almanac. [Conference Address by Gerald Rose, Schiller Institute Conference, September, 1993 Lay summary] – The New Federalist (September 5, 1993). ^ "Freemasonry in Turkey – Address given to Palestine Lodge 189 by Kaya Pasakay, Former Grand Master of the Grand Lodge of Turkey". Palestinelodge189.com. Retrieved 2010-01-12. ^ "List of famous Masons compiled by Abbey Lodge, Abingdon, UK". Abbey.lodge.org.uk. Retrieved 2012-08-08. ^ a b c d e f g h i j k "Famous Free Masons: Athletes". U.S. News & World Report. Retrieved February 13, 2013. ^ "Johann Christian Bach". Grand Lodge of British Columbia and Yukon. 2001-03-19. Retrieved 2010-01-12. ^ Brown, J. Howard (1958). History of Concord Lodge, no. 58, Ancient, Free, and Accepted Masons, Tarbora, North Carolina, 1811–1958. Greenville, North Carolina: Eastern North Carolina Digital Library. p. 8. ^ Smith, Claiborne T., Jr. (1979). In Powell, William S. Dictionary of North Carolina Biography. 1. (A-C). Chapel Hill, North Carolina, USA: University of North Carolina Press. pp. 92–93. ISBN 0-8078-1329-X. ^ "Officers of the GRAND LODGE A.F. & A. M. of NORTH CAROLINA [1787 TO 1887 First One Hundred Years]". Raleigh, North Carolina: Grand Lodge of North Carolina. Retrieved April 13, 2011. ^ Murray, Elizabeth Reid (1983). Wake [Capital County of North Carolina] 1. Raleigh, North Carolina: Capital County Publishing Company. p. 239. ^ ""Edward Jenner – Freemason And Natural Philosopher " In FREEMASONRY TODAY The Official Journal of the United Grand Lodge of England". UGLE. Retrieved 15 April 2012. ^ a b "Large List of Notable and Famous Australian Freemasons". Retrieved 17 April 2012. ^ "Frédéric Auguste Bartholdi". Grand Lodge of British Columbia and Yukon. 1904-10-04. Retrieved 2010-01-12. ^ a b ""Masonic Prime Ministers Of Australia",". The Lectern. In "The Lectern " The Official Publication Of The W.H.J.Mayers Memorial Lodge Of Research Holden Under The Charter Of Gregory Lodge No. 50h Uglq. ^ a b "Large List of Notable and Famous Australian Freemasons". D Hudson. Retrieved 15 April 2012. ^ a b c d e f g h i "List of Grand Masters at the Grand Lodge of New Zealand website". Retrieved 2012-04-06. ^ "Dictionary of Online Biography". Retrieved 27-JUL-2012. ^ "Exsequi Lodge History: Famous Freemasons". Web.archive.org. Archived from the original on 2007-10-30. Retrieved 2010-01-12. ^ a b c d e Papenheim, Martin (2012). "Suche nach dem Grund allen Seins [The Search for the Reason of all Life]". Damals (in German) (5): 24–31. ^ "Irving Berlin". Grand Lodge of British Columbia and Yukon. Retrieved 2010-01-12. ^ a b c d e f g h Randel, Don Michael, ed. (2003). "Freemasonry and Music" (Google eBook). The Harvard Dictionary of Music (Fourth Edition ed.). pp. 333–334. ISBN 0-674-01163-5. Retrieved August 31, 2012. "Other composer-masons include Spohr, Meyerbeer, Mendelssohn, Listz, Puccini, John Philip Sousa, and Irving Berlin"
^ a b c d e f g h i j k Gray, David (2012). The History of the Most Worshipful Prince Hall Grand Lodge of Ohio F&AM 1971–2011: The Fabric of Freemasonry. Columbus, Ohio: Most Worshipful Prince Hall Grand Lodge of Ohio F&AM. p. 414. ISBN 978-0615632957. ^ "Bischof, Francis Erich (Frank) (1904–1979), Australian Dictionary of Biography". ^ "Simón Bolívar". Grand Lodge of British Columbia and Yukon. 2002-01-28. Retrieved 2010-01-12. ^ ""The History of Illinois Freemasonry". Accessed September 25, 2007". Ilmason.org. Retrieved 2010-01-12. ^ a b c d Wauthier, Claude. Africa's Freemasons – A strange inheritance, Le Monde Diplomatique, September 1997. Retrieved 15 August 2008. ^ "Andres Bonifacio Lodge No. 199". Abl199.org. 1973-10-26. Retrieved 2010-01-12. ^ "Welcome to the George Washington National Masonic Memorial". Gwmemorial.org. Retrieved 2010-01-12. ^ Petterchak, Janice A. (2003). Lone Scout: W. D. Boyce and American Boy Scouting. Rochester, Illinois: Legacy Press. ISBN 0-9653198-7-3. Retrieved 2011-03-01. ^ "Famous Australian Freemasons". Freemasonsvic.net.au. Retrieved 2010-01-12. ^ [2012 http://www.santfreemasons.org.au/content/faq "FAQs"]. Grand Lodge of South Australia and Northern Territory. Retrieved 16 April 2012. ^ Reid, Robert. "Freemasons are... Sporting Legends". Freemasonry Victoria (113). ^ "Masonic Care Community of New York". Masonichomeny.org. Retrieved 2010-08-06. ^ "World's Oldest Man is a Brother". Masons of California. Retrieved April 15, 2011. ^ "Oldest Man In North America is also Oldest Shriner". Atlanta, Georgia: YAARAB Shrine of Atlanta. Retrieved April 15, 2011. ^ "World's Oldest Man Dies in U.S. at Age of 114". New York City, New York: Fox News. 2011-04-14. Retrieved April 15, 2011. ^ Beresiner, Yasha (October 2006). "Rabbi and Mason". Masonic Quarterly (19): 7. Retrieved 2011-09-08. ^ Denslow, William R. (1957). 10,000 Famous Freemasons From A to J Part One (Google eBook). p. 133. Retrieved August 1, 2012. ^ Bromwell, Henry P. H. (2010). Restorations of Masonic Geometry and Symbolry. Lovers of the Craft. ISBN 0-9713441-5-9. ^ Christopher Hodapp, Freemasons for Dummies (2005, Wiley), pg. 291. ^ Cotner, Robert (2011-03-04). "Osiris Noble Frank Buckles, Eldest Shriner, Dies in West Virginia". Shrinelines. ^ "Hempstead Lodge News". Texas: Hempstead Lodge. Retrieved February 23, 2012. ^ "Robert Burns, Auld Lang Syne". Masonmusic.org. Retrieved 2010-01-12. ^ "Alessandro Cagliostro". Grand Lodge of British Columbia and Yukon. 2001-05-13. Retrieved 2010-01-12. ^ "Famous Filipino Mason – Manuel Camus". Most Worshipful Grand Lodge of the Philippines. 1949-12-22. Retrieved 2010-01-12. ^ a b "Poinsett – A revolutionary diplomat". Freemasons-freemasonry.com. Retrieved 2010-01-12. ^ "Paul Foster Case". Grand Lodge of British Columbia and Yukon. Retrieved 2010-01-12. ^ Plummer, Charles W.. "General and Brother Joshua L. Chamberlain". MasonicWorld.com. Retrieved 2007-07-16. ^ a b "Pa Freemason May 03 – Treasures of the Temple". Pagrandlodge.org. Retrieved 2010-01-12. ^ Carter, Ric (July/August 2012). "Masonic Hero Gets Rites at Reburial" (PDF). The North Carolina Mason (Raleigh, NC, USA: Grand Lodge of A.F.&A.M. of North Carolina) 137 (4): Page 5, 8. Retrieved September 11, 2012. ^ "1934 World Series was competition between in "Beacon"". JOINT PUBLICATION OF THE GRAND LODGE OF OHIO AND THE OHIO MASONIC HOME. Retrieved 23 April 2012. ^ Denslow (1957). 10,000 Famous Freemasons from A to J. ^ Meades, Jonathan (2005-10-09). "Bigots united". London: Books.guardian.co.uk. Retrieved 2010-01-12. ^ "The secret we should all be let in on". The Age. 3 Sept 2002. Retrieved 17 April 2012. ^ "Famous Australian Freemasons". Seymour Freemasons Lodge 87. Retrieved 17 April 2012. ^ Rob Tillett, Digital Online Technology Pty Ltd (2005-04-07). "South Australian Freemasonry page". Freemasonrysaust.org.au. Retrieved 2010-01-12. ^ "Francesco Crispi". Grand Lodge of British Columbia and Yukon. Retrieved 2010-01-12. ^ Marshall, Sandra (September 29, 2010). "Abraham Curry". Online Nevada Encyclopedia. Retrieved November 5, 2010. ^ "A brief history of the Province of Hampshire and Isle of Wight". Hampshire Freemasonry. Retrieved 18 March 2012. ^ Denslow, William R.; Truman, Harry S. (2004). 10,000 Famous Freemasons from A to J. Kessenger Publishing LLC. p. 285. ISBN 1-4179-7579-2. Retrieved 2010-08-06. ^ "Our "Black Sheep"". Masonicinfo.com. 2006-11-17. Retrieved 2010-01-12. ^ "Past Grand Lodge Elective Officers". Grand Lodge of North Carolina. Retrieved 2011-01-14. ^ "Historical Marker placed by Grand Lodge of Georgia". Cviog.uga.edu. Archived from the original on April 3, 2008. Retrieved 2010-01-12. ^ "Portugal People". Portugal-info.net. Retrieved 2010-01-12. ^ a b "The Hystory Of Freemasonry In Turkey". Freemasons-freemasonry.com. Retrieved 2010-01-12. ^ a b "Well Known Freemasons". Grand Lodge of British Columbia A.F. & A. M. Retrieved February 13, 2013. ^ "Address to the 2002 California Masonic Symposium". Calodges.org. Archived from the original on September 27, 2007. Retrieved 2010-01-12. ^ "Blaise Diagne, député". Web.archive.org. Archived from the original on 2007-06-17. Retrieved 2010-01-12. ^ Denslow, William R.; Truman, Harry S. (2004). 10,000 Famous Freemasons from A to J. Kessenger Publishing LLC. p. 314. ISBN 1-4179-7579-2. Retrieved 2010-08-06. ^ Denslow, William R.; Truman, Harry S. (2004). 10,000 Famous Freemasons from A to J. Kessenger Publishing LLC. ISBN 1-4179-7579-2. Retrieved 2010-08-10. ^ Referenced at the U.S. National Masonic Memorial, Alexandira, Virginia. ^ Dole, Senator Bob (1992 Edition). Freemasonry in American History. Lists of Lodges. pp. 408–410. ISBN ISBN 978-0880530781. ^ "James H. Douglas, Governor of Vermont". Vermont Masonry in Action. Grand Lodge of Vermont. Archived from the original on 2007-06-22. Retrieved 2007-07-16. ^ Stephen, Douglas. "Famous Masons". Pinal Lodge No. 30. Retrieved 28 July 2012. ^ Congressional Directory, 2009–2010, 111th Congress (Google eBook). Washington, DC: U.S. Government Printing Office. p. 243. ISBN 978-0-16-083727-2. Retrieved June 28, 2012. ^ See his biographical entry at the UGLE website for details. ^ a b "A few famous freemasons". Grand Lodge of British Columbia and Yukon. Retrieved 2010-01-12. ^ Evidence of colleague Pete Towshend. ^ a b c d "Freemason and the Royal Society". Gila Valley Lodge # 9, FRS Exhibit at Freemasons Hall, London. Retrieved 2012-01-23. ^ "Freemason and the Royal Society". Gila Valley Lodge # 9, Exhibit at Freemasons Hall, London. Retrieved 2012-01-23. ^ a b Entry Giuseppe Mazzini in Volume III K – P, 10,000 Famous Freemasons, By William R. Denslow], 1957, Macoy Publishing & Masonic Supply Co., Inc.
^ a b Albert G. Mackey, ed. (October 1872 to September 1873). "Fichte as a Freemason". Mackey's National Freemason: 430. ISBN 978-0-7661-5717-0. ^ The Memoirs of Charles G. Finney, The Complete Restored Text, Garth Rosell and Richard Dupuis, eds, Zondervan Publishing House, Grand Rapids, Michigan (1989). Page 629. ^ Lawrence Kestenbaum. "Freemasons, politicians, New York, E-F". The Political Graveyard. Retrieved 2010-01-12. ^ Morris, Robert (Summer 2000). "Alexander Fleming, Mason And Discoverer of Penicillin". The Scottish Rite Journal. Scottish Rite S.J. USA. Retrieved 2007-07-16. ^ [Annual] Reports, December, 1904. Mecca Temple, New York, N.Y.
^ George Thornburgh (2003). Freemasonry When, Where, and How?. Kessinger Publishing. p. 146. ^ a b "Masonic Actors, Musicians and Screen Writers". Phoenixmasonry.org. Retrieved 23 April 2012. ^ a b c "A few famous freemasons". Grand Lodge of British Columbia and Yukon. Retrieved 23 April 2012. ^ Grand Lodge of Minnesota. ^ "Grand Lodge of Pennsylvania's presidents pages". Pagrandlodge.org. 1937-10-30. Retrieved 2010-01-12. ^ a b Beresiner, Yasha. "Musical Masons". MQ Magazine, Issue 8 (January 2004). Retrieved 18 July 2007. ^ "A Few Famous Freemasons". Srjarchives.tripod.com. Retrieved 2010-01-12. ^ Eure, Thad (1948). Biennial Reports of the Secretary of State of North Carolina. Raleigh, North Carolina: North Carolina Department of State. p. 10. Retrieved September 20, 2011. ^ Grand Lodge of North Carolina (July 20, 2010). "Officer of the Grand Lodge A.F. & A. M. of North Carolina". Retrieved September 20, 2011. ^ Davidson, Theodore F. (1889). Cases Argued and Determined in the Supreme Court of North Carolina (Google eBook). Josephus Daniels, State Printer and Binder. p. 476. Retrieved 20 Sept 2011. ^ "Johann Wolfgang von Goethe". Grand Lodge of British Columbia and Yukon. 2001-03-19. Retrieved 2010-01-12. ^ Lazar,, Peter (Edited). It's No Secret, Real Men Wear Aprons. Masonic Care Ltd Australia 2009. p. 107. ISBN 978-0-646-52446-7. ^ "FAQ". Grand Lodge of South Australia and Northern Territory. Retrieved 17 April 2012. ^ "Australia's Prime Ministers, Fast facts: John Gorton". National Archives of Australia. Retrieved 17 April 2012. ^ "UNVEILED: THE MASONIC MYSTERY". The Sydney Morning Herald. 7 August 1988. Retrieved 17 April 2012. ^ "Masonic Prime Ministers Of Australia". The Lectern (he W.H.J.Mayers Memorial Lodge Of Research Holden Under The Charter Of Gregory Lodge No. 50h Uglq). Retrieved 17 April 2012. ^ Hudson, D. "Large List of Notable and Famous Australian Freemasons". Retrieved 17 April 2012. ^ Konrad Fuchs (1994). "Schaffgotsch, Philipp Gotthard, Graf von". In Bautz, Traugott. Biographisch-Bibliographisches Kirchenlexikon (BBKL) (in German) 8. Herzberg: Bautz. cols. 1568–1569. ISBN 3-88309-053-0. ^ Congressional Directory, 2009–2010, 111th Congress (Google eBook). Washington, DC: U.S. Government Printing Office. p. 100. ISBN 978-0-16-083727-2. Retrieved June 28, 2012. ^ "Americas Astronauts FDCs". Phoenixmasonry.org. Retrieved 2010-01-12. ^ Denslow, William (1957). 10,000 Famous Freemasons from A to J Part 1. p. 148. Retrieved October 8, 2012. ^ Denslow, William R. (1958). 10,000 Famous Freemasons, vol. ii. [Trenton, Missouri. : Missouri Lodge of Research / Educational Bureau, Royal Arch Mason Magazine]. p. 165. ^ "What Are the Facts About National Treasure? - Beliefnet.com". Beliefnet.com<!. Retrieved 2010-01-12. ^ "A long-lost bell goes home". News and Observer. 2008-11-19. Retrieved 2010-06-03. ^ "1923 Agromeck-Square and Compass". NCSU. 1923. Retrieved 2010-06-03. ^ Silber, Gordon. Eighteenth-Century Studies. Johns Hopkins University Press. pp. 421–4. ^ Official website of the Provincial Grand Lodge of Norfolk, with details and photograph. ^ "United Grand Lodges of Serbia". Retrieved 2012-01-23. ^ J. Edgar, Hoover. "Masonic Biographes". Masonic Research. freemasonry.bcy.ca. Retrieved 29 July 2012. ^ "Masonic Magicians". Mill-valley.freemasonry.biz. Retrieved 2010-01-12. ^ Freemasonry in Bristol, Powell & Littlejohn, privately published. ^ See also the Freemasons' Review, June 1844 edition – Howley's masonry was a well known contemporary fact. ^ See also the Freemasons' Quarterly Review, first quarter, 1835 – a survey of the Archbishop's masonic career. ^ Amy Lotven (17 March 2005). "Masons Seek New Members As Elder Brothers Pass On". Queens Chronicle Newspaper. Retrieved 20 May 2010. ^ "Obituary for Charles Philip Ingalls". Definitive Laura Ingalls Wilder and Little House on the Prairie. Retrieved February 7, 2013. ^ "Grave of Charles Ingalls on Find-A-Grave with photo of headstone with large Square and Compasses". Retrieved 20 March 2013. ^ "America's Astronauts Masonic First Day Covers". Phoenix, AZ: Phoenixmasonry Masonic Museum and Library. Retrieved June 19, 2012. ^ "Freemasons in Space". Vancouver, BC, Canada: Grand Lodge of British Columbia and Yukon. Retrieved June 19, 2012. ^ "Masonic Presidents, Andrew Jackson". Retrieved 28-JUL-2012. ^ "Famous Filipino Mason – Graciano Lopez Jaena". Most Worshipful Grand Lodge of the Philippines. Retrieved 2010-01-12. ^ "Meet the New Governor General". Freemason 35 (August 2003): 10. ISSN 1039-6977. Retrieved 18 April 2012. ^ "Who are some well known Australian Freemasons?". Grand Lodge of South Australia and Northern Territory. Retrieved 18 April 2012. ^ "September Communication of Grand Lodge". Freemason (Freemasons NSW & ACT) 36 (5): 15. Oct 2004. ^ Hudson, D. "Large List of Notable and Famous Australian Freemasons". Retrieved 18 April 2012. ^ R.W.Bro. Vic Lewis. "Grand Lodge of Nova Scotia A.F. & A.M". Grandlodgens.org. Retrieved 2010-01-12. ^ Biography and photograph of Middlesex official provincial website. ^ Referenced on the Middlesex Mark website. ^ Ewans, Martin (2002). Afghanistan. Harper Perennial. p. 114. ISBN 0-06-050508-7. ^ Denslow 10,000 Famous Freemasons, volume 3. ^ "Rudyard Kipling". Grand Lodge of British Columbia and Yukon. Retrieved 2010-01-12. ^ a b "A Bavarian Illuminati primer". Grand Lodge of British Columbia and Yukon. Retrieved 2010-01-12. ^ Denslow, William, ed. (2004). 10,000 Famous Freemasons (Google eBook). From K to z, Volume 3. Harry S. Truman. Whitefish, Montanna: Kessinger Publishing Rare Reprints. p. 36. ISBN 1-4179-7578-4. Retrieved March 15, 2012. ^ "Emessay Notes February 2010". The Masonic Service Association of NA. Retrieved 19 April 2012. ^ "Famous Filipino Mason – Jose Laurel". Most Worshipful Grand Lodge of the Philippines. Retrieved 2010-01-12. ^ Nickerson, Sereno Dwight; Titus, Charles H. (1875). The New England Freemason. Frank Wood. ISBN 1-157-39032-3. Retrieved 2010-08-04. ^ Denslow, William R; Truman, Harry S (2004-09). 10,000 Famous Freemasons from K to Z, William R. Denslow and Harry S. Truman, Kessinger Publishing's Rare Reprints, 2004 ISBN 978-1-4179-7579-2. Books.google.com. ISBN 978-1-4179-7579-2. Retrieved 2010-01-12. ^ Stillson, Henry Leonard; Hughan, William James (1891). History of the Ancient and Honorable Fraternity of Free and Accepted Masons. The Fraternity Publishing Company. ISBN 978-0-7661-2661-9. Retrieved 2010-08-04. ^ Denslow, William R.; Truman, Harry S. (2004). 10,000 Famous Freemasons from K to Z. Kessenger Publishing LLC. ISBN 1-4179-7579-2. Retrieved 2010-08-06. ^ "Lady Lever Art Gallery, Masonic Lodge Apron". Liverpool Museum. 2011. Retrieved July 7, 2011. ^ "About Phoenix Lodge 3236". Phoenix Lodge 3236. Retrieved July 8, 2011. ^ "About St Hilary Lodge". St Hilary Lodge. Retrieved July 8, 2011. ^ "Mersey Lodge 5434". Mersey Lodge 5434. Retrieved July 7, 2011. ^ HAMILL, John. "Oxford Journals, Humanities, Journal of the History of Collections, Volume4, Issue2". Oxford Press. pp. Pp. 285–295. ISBN 0-9516355-2-2. Retrieved July 8, 2011. ^ Lawrence Kestenbaum. "Freemasons in Rhode Island". The Political Graveyard. Retrieved 2010-01-12. ^ "Ossipee Valley Masonic Lodge". nhmasons.org. Retrieved 2012-07-28. ^ "Scottish Rite Journel-Charles Lindbergh". Scottish Rite. Retrieved 2012-07-28. ^ District Grand Lodge of Jamaica report. ^ Ancient & Accepted Rite for England & Wales, "Rules, Regulations, & List of Members 1992" page 377. ^ "Harold LLoyd" "In 1949, Harold's face graced the cover of TIME Magazine as the Imperial Potentate of the Ancient Arabic Order of the Nobles of the Mystic Shrine, their highest-ranking position. He devoted an entire year to visiting 130 temples across the country giving speeches for over 700,000 Shriners. The last twenty years of his life he worked tirelessly for the twenty-two Shriner Hospitals for Children and in 1960s, he was named President and Chairman of the Board. ^ "Ill. Trent Lott, 33°, Grand Cross". Srmason-sj.org. Retrieved 2010-01-12. ^ "Famous Filipino Masons – Juan Luna". Most Worshipful Grand Lodge of the Philippines. Retrieved 2010-01-12. ^ "Famous Filipino Masons – Apolinario Mabini". Most Worshipful Grand Lodge of the Philippines. 1903-05-13. Retrieved 2010-01-12. ^ Denslow, William (1957). 10,000 Famous Freemasons from K to Z Part 2. p. 411. Retrieved October 8, 2012. ^ Blackmar, Frank Wilson (1912). Kansas: a cyclopedia of state history, embracing events, institutions, industries, counties, cities, towns, prominent persons, etc. ... with a supplementary volume devoted to selected personal history and reminiscence (Public domain ed.). Standard publishing company. pp. 482–. Retrieved 19 February 2012. ^ Martin, Georges. "La Droit Humain". Co-Masonary. International Co-Masonary Org. Retrieved 29 July 2012. ^ The Virginia Magazine of History and Biography. Virginia Historical Society. 1901. Retrieved 2010-08-05. "A Biographical Sketch of General Joseph Martin"
^ Denslow, William R.; Truman, Harry S. (2004). 10,000 Famous Freemasons from K to Z. Kessenger Publishing LLC. ISBN 1-4179-7579-2. Retrieved 2010-08-10. ^ "mastermason.com". mastermason.com. Retrieved 2010-01-12. ^ Mabberley, D. J. (1985) William Theobald (1829–1908): Unwitting Reformer of Botanical Nomenclature? Taxon 34(1):152–156. ^ H. Paul Jeffers. 'The Freemasons in America' page 113. Citadel Press. Retrieved 28-Jul-2012. ^ Discussed here in Italian. ^ a b "History". Web.archive.org. 2007-04-15. Archived from the original on 2007-04-15. Retrieved 2010-01-12. ^ Ullrich, Dieter C. "Ned Ray McWherter (1930– )." Special Collections and Archive. Paul Meek Library. University of Tennessee at Martin. 3 Apr. 2000. ^ a b "Freemasons NSW & ACT". Uglnsw.freemasonry.org.au. Retrieved 2010-01-12. ^ "Fast Fact; Robert Menzies". National Archives of Australia. Retrieved 16 April 2012. ^ "Famous Prince Hall Freemasons, Grand Lodge BC&Y website". Grand Lodge of British Columbia and Yukon. 2003-05-16. Retrieved 2010-01-12. ^ "Prince Hall Grand Lodge of Pennsylvania". Princehall-pa.org. Retrieved 2010-01-12. ^ Foreman, Grant. Jesse Bartley Milam. Chronicles of Oklahoma.'.' Retrieved 23 June 2009. ^ "America's Astronaughts Masonic First Day Covers". Phoenix, Arizona: Phoenix Masonry Masonic Museum and Library. Retrieved June 19, 2012. ^ George Day Cedar Lodge. "Famous Freemasons from around the world". Durham.net. Retrieved 2010-01-12. ^ a b "MQ magazine on-line". Mqmagazine.co.uk. 1903-05-01. Retrieved 2010-01-12. ^ "Masonic US Presidents". Pagrandlodge.org. Retrieved 2010-01-12. ^ Freemasonry Today. "Freemasonry Today on-line". Freemasonrytoday.com. Retrieved 2010-01-12. ^ a b "Jacques and Joseph Montgolfier". Grand Lodge of British Columbia and Yukon. 2002-01-28. Retrieved 2010-01-12. ^ Morita, Pat. "Morocco Shriner". Our Kids. MoroccoShrine.org. ^ Morita, Pat. "Shriner News". Shriner International Headquarters News. NAPSA. Retrieved 6 December 2012. ^ "Famous Freemasons, M through Z". Retrieved 2007-08-01. ^ "James Naismith". Grand Lodge of British Columbia and Yukon. Retrieved 2011-05-22. ^ "The Danish Order of Freemasons" (in Danish). Den Store Danske. Retrieved 2012-02-29. ^ "Famous Filipino Mason – Sen. Camilo Osias". Most Worshipful Grand Lodge of the Philippines. 1976-05-20. Retrieved 2010-01-12. ^ "Scottish Rite Goes a Little Country". Scottishrite.org. 2006-10-28. Retrieved 2010-01-12. ^ "Famous Filipino Mason – Rafael Palma". Most Worshipful Grand Lodge of the Philippines. Retrieved 2010-01-12. ^ "Famous Filipino Mason – Quintin Paredes". Most Worshipful Grand Lodge of the Philippines. 1973-01-30. Retrieved 2010-01-12. ^ "Richard Parsons 1st Earl of Rosse". Grand Lodge of British Columbia and Yukon. 2004-04-23. Retrieved 2010-01-12. ^ "Columbia 14th Lodge, AF&AM". The Boulder Freemasons. 2007-01-01. Retrieved 2012-01-23. ^ "Orelans, Duke of", Letter O, Encyclopedia of Freemasonry and its kindres sciences, by Albert C. Mackey M. D.
^ Edward L. King. "Famous Freemasons M-Z". Masonicinfo.com. Retrieved 2010-01-12. ^ "PA GL". Web.archive.org. Archived from the original on 2007-03-23. Retrieved 2010-01-12. ^ "Famous Filipino Mason – Marcelo H Del Pilar". Most Worshipful Grand Lodge of the Philippines. Retrieved 2010-01-12. ^ "Pa Freemason May 3 – Bronson Pinchot". ^ Trevor W. McKeown (2002-10-22). "Famous Prince Hall Freemasons". Grand Lodge of British Columbia and Yukon. Retrieved 2010-05-08. ^ "Augustus Le Plongeon (photograph)". Retrieved 2010-01-12. ^ Grand Lodge AF&AM of North Carolina (1998). "Officers of the Grand Lodge, A.F. & A.M. of North Carolina, the first 100 years". Raleigh, North Carolina, USA: Grand Lodge of North Carolina. Retrieved May 23, 2011. ^ *McFarland, Daniel M. (1979). In Powell, William S. Dictionary of North Carolina Biography (Google eBook). Volume 5 (P-S) (1 ed.). Chapel Hill, North Carolina: University of North Carolina Press. ISBN 0-8078-2100-4. Retrieved February 17, 2011. ^ "Past Masters of Phalanx Lodge No. 31 AF&AM Charlotte". Charlotte, North Carolina: Phalanx Lodge No. 31. Retrieved October 12, 2011. ^ "Famous Filipino Masons – Mariano Ponce". Most Worshipful Grand Lodge of the Philippines. 1918-05-23. Retrieved 2010-01-12. ^ Ridley, Jasper. The Freemasons: A History of the World's Most Powerful Secret Society. p. 46. ^ "Preston Illust. Masonry". Freemasons-freemasonry.com. Retrieved 2010-01-12. ^ "hiramlodge88.org, Hiram Lodge # 88". Hiramlodge88.org. Retrieved 2010-01-12. ^ "jacquesdemolay305.org, Charter Members". jacquesdemolay305.org. Retrieved 2010-01-12. ^ "Famous Masons – Manuel L. Quezon". Most Worshipful Grand Lodge of the Philippines. Retrieved 2010-01-12. ^ "Well Known Freemasons". Mastermason.com. Retrieved 2010-01-12. ^ "In search of the Hill's Freemasons - Eamon Javers - POLITICO.com". Politico.Com<!. Retrieved 2010-01-12. ^ Biography of Chevalier Andrew Michael Ramsay, Grand Lodge BC&Y website. ^ "freemasonry.org". Web.archive.org. Archived from the original on 2006-01-07. Retrieved 2010-01-12. ^ Beevor, R. J. (1931). Hastings of Hastings. Printed for Private Circulation. p. 59. ^ Produced by Cheryl Mettendorf (2008-04-24). "Video about Philly Freemason". Abclocal.go.com. Retrieved 2010-01-12. ^ "Famous Mason – Isabelo delos Reyes". Most Worshipful Grand Lodge of the Philippines. 1938-10-12. Retrieved 2010-01-12. ^ "The Scottish Rite Journal". Srmason-sj.org. Retrieved 2010-01-12. ^ See the Lodge's official website. ^ Report of actor's son, Nicolas Ridley, discussing his father. ^ Report in UGLE magazine MQ. ^ "Australian Dictionary of Biography". Adb.online.anu.edu.au. Retrieved 2010-01-12. ^ "Famous Filipino Masons – Jose Rizal". Most Worshipful Grand Lodge of the Philippines. 2001-12-31. Retrieved 2010-01-12. ^ "A few famous freemasons". Grand Lodge of British Columbia and Yukon A.F. & A.M. Retrieved 25 April 2012. ^ "Scottish Rite Journal". Srjarchives.tripod.com. Retrieved 2010-01-12. ^ "Robert Farnon Society". Rfsoc.org.uk. Retrieved 2010-01-12. ^ Denslow, William; Forward by Harry Truman (1957). 10,000 Famous Freemasons. Macoy Publishing & Masonic Supply Co. p. R. ISBN 9781887560061. Retrieved 2013-02-13. ^ Leo Damrosch, Jean-Jacques Rousseau: Restless Genius (New York: Houghton Mifflin, 2005) p. 492-493. ^ "Famous Filipino Mason – Pres. Manuel Roxas". Most Worshipful Grand Lodge of the Philippines. Retrieved 2010-01-12. ^ Rumford, William Byron, interviewee; Joyce Henderson, Amelia R. Fry, and Edward France, interviewers (1973). Legislator for fair employment, fair housing and public health : oral history transcript. Berkeley: Bancroft Library. Regional Oral History Office. p. 3. Retrieved 2009-11-09. ^ Anonymous (2003). Representative British Freemasons. pp. 12–13. ISBN 978-0766135895. ^ "Famous Filipino Masons – Lope K. Santos". Most Worshipful Grand Lodge of the Philippines. 1963-05-01. Retrieved 2010-01-12. ^ Jeffers, H. Paul (2005). Freemasons: Inside the World's Oldest Secret Society (Google eBook). New York New York: Citadel Press Books. p. 75. ISBN 0-8065-2662-9. Retrieved July 19, 2012. ^ "Sir Ernest Shackleton". Grand Lodge of British Columbia and Yukon. Retrieved 2010-01-12. ^ The North Carolina Mason, Volume 133, Number 3, 2008. ^ "Congressman Heath Shuler to be raised!". Wnctrestleboard.blogspot.com. 2008-04-08. Retrieved 2010-01-12. ^ "Jean Sibelius". Grand Lodge of British Columbia and Yukon. Retrieved 2010-01-12. ^ Baynard, Samuel Harrison (2003-06). History of the Supreme Council of the 33rd Degree of Ancient Accepted Scottish Rite of Freemasonry. Books.google.com. ISBN 978-0-7661-6549-6. Retrieved 2010-01-12. ^ "Vincennes University Dedicates Red Skelton Performing Arts Theatre". The Supreme Council, 33°, A.A. & S.R. of Freemasonry, S.J., USA. Retrieved 19 April 2012. ^ a b "The Morman Church and Freemasonry". Web.archive.org. Archived from the original on 2007-07-14. Retrieved 2010-01-12. ^ "lds-mormon.com". lds-mormon.com. Retrieved 2010-01-12. ^ "Angelo Soliman 1721–1796". Retrieved 27 JUL 2012. ^ Churchill, 8th Duke of Marlborough. "Churchill Freemason". Churchills who were Freemasons. freemasons-freemasonry/com. Retrieved 30 July 2012. ^ "Grand Lodge of Scotland". Grandlodgescotland.com. Retrieved 2010-01-12. ^ "Wolnomularz Polski". Wolnomularz.pl. Retrieved 2010-01-12. ^ "Civil Service Lodge, No. 148 GRC, Ottawa 1865–present". Retrieved 2009-08-03. ^ "Stone, William Leete". Appletons' Cyclopædia of American Biography. 1900. ^ "William Stukeley". Grand Lodge of British Columbia and Yukon. 2002-05-28. Retrieved 2010-01-12. ^ Denslow, William R.; Truman, Harry S. (2004). 10,000 Famous Freemasons from A to J. Kessenger Publishing LLC. ISBN 1-4179-7579-2. Retrieved 2012-01-23. ^ "The History of Freemasonry in Turkey". Grand Lodge of Free and Accepted Masons of Turkey. Retrieved 2010-01-12. ^ "HOUSE JOINT RESOLUTION 531: A RESOLUTION to congratulate the members and leadership of Hess Lodge #93 Free and Accepted Masons of Dyersburg on the celebration of their 160th anniversary on October 8th, 2000.". Nashville, Tennessee: Tennessee State General Assembly. June 16, 2000. p. 2. Retrieved June 27, 2012. "WHEREAS, several Dyersburg Masons have distinguished themselves as men of stature in our great state and nation, including the Honorable John S. Tanner, U.S. Congressman for Tennessee's 8th Congressional District;"
^ Congressional Directory, 2009–2010, 111th Congress (Google eBook). Washington, DC: U.S. Government Printing Office. p. 246. ISBN 978-0-16-083727-2. Retrieved June 27, 2012. ^ "Thirty-third Degree Conferred on Congressman John S. Tanner". Washington, DC: Scottish Rite, Southern Jurisdiction. May/June 2004. Retrieved June 27, 2012. ^ "Officers of the Grand Lodge, A.F. & A.M. of North Carolina, the first 100 years". Raleigh, North Carolina, USA: Grand Lodge of North Carolina. Retrieved 2011-01-19. ^ Congressional Directory, 2009–2010, 111th Congress (Google eBook). Washington, DC: U.S. Government Printing Office. p. 157. ISBN 978-0-16-083727-2. Retrieved June 28, 2012. ^ "Gizeh Shriners of British Columbia and the Yukon". Shriners.bc.ca. Retrieved 2010-01-12. ^ "History of Jackson Lodge". Jacksonlodge146.org. Retrieved 2010-01-12. ^ "Harry S Truman". Grand Lodge of British Columbia and Yukon. Retrieved 2010-01-12. ^ Burnworth, Gerald. "Brother Samuel Langhorne Clemens: A Missouri Freemason". Paper read September 28, 1999 at the 178th Annual Communication of the Grand Lodge of Missouri. Retrieved July 2, 2007. ^ "Be a Shriner Now [Famous Shriners]". Tampa, Florida, USA: Shriners International. Retrieved 2011-01-24. ^ "Grand Lodge of India". Masonindia.org. Retrieved 2010-01-12. ^ Wainwright, Jonathan. "Famous Freemasons". Pinal Lodge No. 30. Retrieved 28 July 2012. ^ Wainwright, Jonathan M.; Source, Denslo. "Hero of Bataan". 1989–90 Masonic Research. srjarchives.tripod.com. Retrieved 30 July 2012. ^ Gilbert, R. A.. "The Masonic Career of A. E. Waite". Ars Quatuor Coronatorum. QCCC Correspondence Circle Limited. Retrieved 23 May 2010. ^ "Sir Charles Warren". Grand Lodge of British Columbia and Yukon. Retrieved 2010-01-12. ^ "Booker T. Washington". Grand Lodge of British Columbia and Yukon A.F. & A. M. Retrieved 25 April 2012. ^ "George Washington Masonic Memoria". Gwmemorial.org. Retrieved 2010-01-12. ^ "Gl Bc&Y". Grand Lodge of British Columbia and Yukon. Retrieved 2010-01-12. ^ Snow, Richard D. From Out of the Wilderness: A 200 Year History of New England Lodge No. 4, F. & A.M. of Ohio 1803–2003. New England Lodge No. 4. pp. 47–60. ^ "Dr. Charles H. Wesley". Grand Lodge of British Columbia and Yukon A.F. & A. M. Retrieved 25 April 2012. ^ "Charles Harris Wesley,". Retrieved 25 April 2012. ^ "The Wilde Oxford Freemason". Web.archive.org. 2007-08-02. Archived from the original on 2007-10-11. Retrieved 2010-01-12. ^ "Scottish Rite Journal – Notes from "The Northern Light"". March 2010. Retrieved 1 January 2013. ^ "Jeff Winter". Mqmagazine.co.uk. Retrieved 2010-01-12. ^ Leaders of the Canadian Church, Part IX. ^ "Sir Christopher Wren". Grand Lodge of British Columbia and Yukon. Retrieved 2010-01-12. ^ "Sir Christopher Wren adoption". Grand Lodge of British Columbia and Yukon. 2001-03-15. Retrieved 2010-01-12. ^ "Ed Wynn". Grand Lodge of British Columbia and Yukon. Retrieved 19 April 2012. ^ "The Famous Masons Series". The Waller Masonic Lodge #808 AF & AM E-Newsletter September 2007. Retrieved 19 April 2012. ^ "Vincennes University Dedicates Red Skelton Performing Arts Theatre". The Supreme Council Ancietn and Accepted Scottish Rite, Southern Jurisdiction USA. Retrieved 19 April 2012. ^ Braatz, George (Summer 2011). Ohio Mason Still Dominates Baseball Statistics 18 (3). p. 7. ^ "A few famous freemasons". Grand Lodge of British Columbia and Yukon. Retrieved 19 April 2012. ^ Denslow, William R. (1957). 10,000 Famous Freemasons Volume IV Q – Z. Macoy Publishing & Masonic Supply Co., Inc.